In light of all the Republican hysteria surrounding entitlement reform Panderbear decided to take a look at the 2011 annual reports by the Social Security and Medicare Boards of Trustees. Guess what? The sky is not falling. Is the Social Security trust fund broke? Nope. If there are no policy changes trust fund reserves will not be exhausted until 2036. Hell, Panderbear doesn't even plan to be around then! Thereafter, tax income would be sufficient to pay about three-quarters of scheduled benefits through 2085. Does it need some tweaking? Sure, but not right away and nothing drastic like privatization is required. What about Medicare? The projected date of HI (hospital insurance) trust fund exhaustion is 2024 at which time dedicated revenues will be sufficient to pay 90 percent of HI costs. 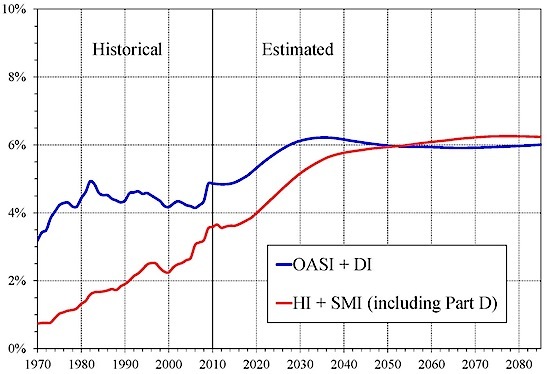 The share of HI expenditures that can be financed with HI dedicated revenues is projected to decline slowly to 75 percent in 2045, and then to rise slowly, reaching 88 percent in 2085. So Medicare could use some tweaking as well, but even if nothing is done Medicare recipients' copays would have to increase to cover at most 25% more of their health care expenses. That's bad and should be avoided, but it is not catastrophic and it isn't happening tomorrow. If we look at the chart showing historical and projected costs of these two programs as a percent of GDP, what we don't see are exponentially increasing curves rising to infinity. Instead both Social Security and Medicare level off at about 6% of GDP. Panderbear doesn't think that's too much to ensure our seniors continue to live with some measure of security, dignity, and access to proper health care. So why are Republicans so frantic to reform entitlements right now? Well, it certainly isn't because Social Security and Medicare are bankrupt. They aren't. Could it be that Republicans simply don't like entitlement programs whose benefits recipients have earned by paying into them? That they would gleefully dismember the social safety net? Panderbear can only speculate as to Republicans' true motives. What Panderbear can say for sure is that we must resist their demands for precipitous and drastic changes to entitlements, because their claims regarding these programs' imminent demise are highly exaggerated.